Much of our South Island and parts of the North Island are experiencing severe winter weather, including snow down to sea level, road and airport closures, and power cuts. Here in Nelson, the hills got snow to lower than usual level but from the look of it no snow in Motueka township like three weeks ago, Southerlies (that's the cold one,) is blowing occasionally, but the temperature is nothing out of the ordinary for this time of the year, and the sun is blindingly bright. As has been the moon. Once again, business as usual in Nelson, with a tinge of fair-weather guilt. 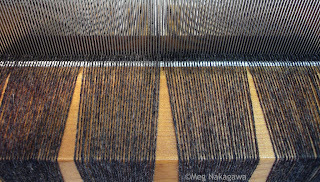 I resleyed the cashmere warp on the big loom several times yesterday, (more about it later,) have modified drafts gazillion times, came to realize how drafts/structures behave differently with the cashmere as opposed to merino or cotton, but can't come to a nice solution on Mom's draft. 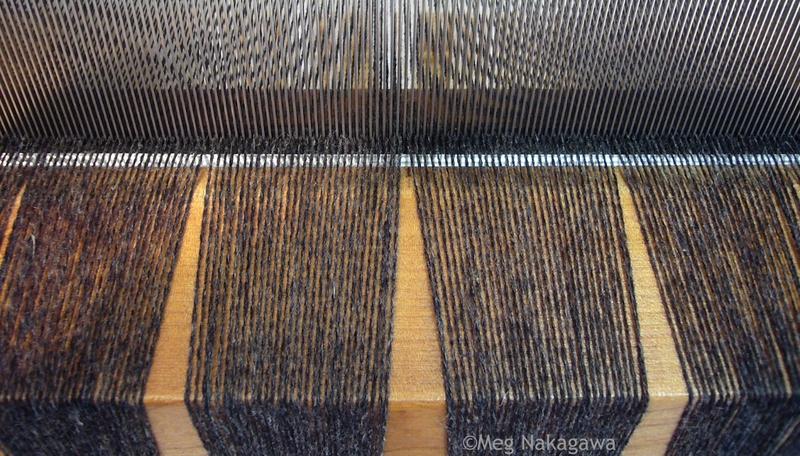 I'm going downstairs soon to sample some more, but I now have to decide whether I want these three cashmere pieces to be cloud-light and soft and cushy, or soft and lovely but meaty. Why, though, do sleying mistakes always pop up in the center, and never towards the sides? This was was in the dead center yesterday. OK, the wind is picking up, but still nothing "severe".